This blog is about marathon running. 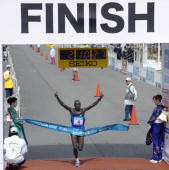 It contains step by step guides for marathon training and many marathon training tips. The first and most important step in finding the right brand and model of running shoe is to work out which type of foot you have. When running normally, the outside of the heel strikes the ground first in a supinated position - this is why the wear is common in this area. The foot then rolls inward and flattens out along the longitudinal arch-pronation. The foot should then supinate by rolling through the ball – thus the foot becomes a rigid lever for efficient propulsion. These are the normal and healthy movements of the foot, but a number of biomechanical flaws can occur disrupting this pattern. A well chosen running shoe can help compensate for this and in most cases will restore normal motion. An inappropriate running shoe can actually have the effect of interfering with this normal function. Most runners who encounter injury either over pronate, which means the foot rolls inward or over supinate, which is the opposite. Over pronation is the most widespread cause of running injury. A pronated foot rolls inwards at the ankle, the midfoot bulges inwards and the longitudinal arch flattens. Over-pronators usually have very flexible and unstable feet. To compensate for this they need running shoes with a lot of motion control. Motion control running shoes give a high level of support - a firmer anti-pronation post on the inside of the midsole; a firm or dual density midsole; and a a firm heel counter. Running Shoes - Tips on Buying Running Shoes. The following are some tips to help you to buy the best running shoes for you. When shopping for running shoes you should always go in the afternoon as believe it or not your feet get bigger as the day goes on and will certainly do so during the marathon. You should also go shopping wearing the type of socks that you would normally wear while running. It can also be helpful to bring an old pair of running shoes with you, a knowledgeable sales person can study the wear patterns and determine the type of shoe that will suit you best. Running Shoes - Structure of Running Shoes. Running shoes are the most important weapon in the arsenal of the marathon runner. They are a vital element in the prevention of injuries and help to improve running gait. The market for running shoes is huge and the top companies such as Asics, Nike, Addidas, Reebok, Mizuna and New Balance invest an enormous amount of time and money in the technology of running shoes. The outsole: This is the under surface of the running shoe. It is normally treaded and made out of moulded carbon rubber. It must be resistant to wear and often features a studded or waffle pattern to improve traction. The midsole: This is the most important part of the running shoe as it provides for cushioning and stability. The midsole is most commonly constructed of ethylene vinyl acetate (EVA), polyurethane (PU) or a combination of the two. A dual density midsole is often a feature in high end running shoes, that has a firmer material on the inner side to help limit pronation (rolling in) of the foot. Many manufacturers have invented their own unique midsole technologies for their running shoes, for example air for Nike, gel for Asics and high tech plastics for Under Armour. The upper: This is the part of the shoe that covers the top of the foot. It can be made out of leather but it is more usual for it to be composed of a more light weight synthetic material with ventilation. The tongue of the upper should be padded to cushion the top of the foot against the pressure from the laces. The back of the running shoe is heavily padded to protect the Achilles tendon. The heel counter: This part of the running shoe is responsible for motion control. It is an inflexible cup that surrounds the heel and is built into the upper of the shoe. Post or footbridge: The footbridge is a band of extra cushioning material on the arch side of the midsole of the running shoe. This is there to counteract pronation.
. They are perfect for my neutral gait and lasted me through four marathons. A full review of Nike Air Max Moto 6 will follow in a later post. Running Shoes - Choosing the right shoes. For an avid runner, buying a new pair of running shoes can be a frustrating task. It is something that should be carefully considered and not rushed into. The complex and often fragile nature of our bodies, and the stresses placed on the body by running means that you must choose wisely. Cheapness or convenience should not be factors in that choice. Despite the fact that no two people have exactly the same foot, manufactures have divided running shoes into three different types: Cushioning, Stability, and Motion Control. Of course there is a lot of room for variation within these categories, but they are a good place to start. Cushioning - Cushioning running shoes are shoes that have little to no lateral support. They are perfect for runners who do not need this lateral support, and have neutral feet. Runners with a high arch will need a running shoe with cushioning properties. This type of running shoe would not be right for a pronator or an over pronator. Stability - Stability shoes offer a balance between cushioning and motion control. This running shoe is designed for the runner who has a normal arch, lands on the outside of the foot and rolls forward. This type of running shoe is where you should start if you do not know what type of runner you are. Motion Control - Runners who really need support from their running shoe should buy shoes in this category. Runners who are dealing with weak ankles and other foot problems as well as extreme pronators and overpronators can take advantage of a Motion control shoe. The running shoes in this bracket offer a lot of stability. Of course the above categories are only meant as a quick guide to help you know what to look for in a running shoe. There are a lot of variations that can occur within these categories. If you are a serious runner then the smartest course of action would be to pay a visit to a specailised running store. These are often staffed by other runners and will be able to properly analyze your running style and fit you out with shoes to suit your exact style. If you have serious foot problems like extreme pronation or fallen arches, you should consider visiting a foot doctor, as running shoes alone may not sort out your problems. You may need orthotics, or perhaps a routine strengthening exercises to keep you running. Before beginning any marathon training plan, a firm understanding of the principles of training is needed. There are four, Progression, Specificity, Individualisation and Overload. In addition to these I will outline the importance of tapering and the long run in your marathon training. Progression: Gradual progression is all important in endurance running. The idea is to slowly increase the miles or the time you spend on your feet each week, improving your fitness and endurance without too much discomfort. Add around five or ten per cent to your weekly miles or time spent training each week to fully reap the benefits. Progression is essential in reducing the risk of picking up an injury as it allows you to build up stamina in your heart and lungs, as well as your legs in a safe way. Specificity: Cross training is hugely important in marathon training. However it is vital to maintain focus on your running. Swimming, cycling and resistance training are ideal for overall fitness and combating boredom, but be sure to limit your cross training sessions to one per week. Individualization: Not all runners are created equal and each will take to a marathon training program differently. This fact often makes it difficult to train with others. Even though running with other people with the same goals can be enjoyable it is of greater benefit if you stick to your own marathon training plan and run solo. Marathon running is not a team sport. Overload: Overload is where you expose your body to a greatly increased level of exertion, followed by the necessary amount of rest. The weekend long run is an example of overload and you should have a rest day following this run built into your marathon training program. Overloading is not to be confused with overtraining, which is doing too much running without taking the proper rest. The long run: Completing the long run every week will give you a regular boost of confidence. It is without doubt the most important component of marathon training. These runs will prepare your body for the rigors and hardships it will be subjected to on marathon day. The longest you should run in training should be twenty miles and this run should be done at least three weeks before the marathon in order for you to be recovered in time for race day. Tapering: The taper period is the ten or so days in the lead up to the marathon itself. It is utterly vital that you cut your marathon training right back. Your runs during this taper period should be thirty or forty minutes long and no more. Your body will take a pounding on race day and this is the time to let it rest and prepare. For more information on Marathon Training Click Here! Marathon Training - Types of Training. Marathon training is not just about pounding the streets day in day out. There are other forms of training, however it must be stressed that these are more relevant as your training develops. Gradually increase the time you spend on your feet and when you are at the right stage of your training you can start to mix it up. Hill Training. Hill training can build strength in your legs and greatly improve the development of your cardiovascular system. There are many approaches to hill training, with many runners using treadmills in the gym. Others choose an outdoor route with a certain number of hills, while some train using one of two key hills and run up and down them a number of times. This can be extreme, but can have major physiological benefits. Fartlek training. Fartlek is Swedish for 'speed play'. It is a type of running training more for runners trying to improve their times than those just looking to get round their first marathon. Speed play is the use of markers on your route for bursts of quicker running. You may run past a line of trees or lamp posts and you alternate your speed between them, fast between one set of two, a slow recovery jog, and then fast again between the next two. This form of marathon training has huge benefits in developing heart and lungs. Interval Training. This is again more of interest to marathon runners looking for improved times. It involves repetitions that are timed, often involving a running track. You would complete track circuits in a certain time, have a break and then do the same again. Over time you will notice improvements in the time taken to complete the reps and also the recovery period between these reps.
Cross Training. The best forms of cross training for runners are cycling, swimming and the cardio vascular workout machines at the gym, like the rowing machine. Cross training can relieve pressure on your legs and add a bit of variety to your training. Cross training is a great way of giving your legs a break and staying fresh mentally but should be confined to one session a week. Resistance Training. This type of training is concerned with the lifting of weights. This will give you an all over body workout and will train muscles that running can never touch. It will also help your core stability, important in injury prevention. Warming up, cooling down, stretching. Before you begin your main session you should spend a few minutes warming up. This may take the form of a brisk walk of a gentle jog. This serves to raise the heart rate and get the blood flowing to the muscles. It is then vital to do some light stretching to loosen up the joints. After your main session it is important that you do not just stop. You must cool down slowly and allow your heart rate to return to normal. Lastly it is time to stretch. Marathon Training - The Gym. Using a gym is an important part of any marathon training plan for a number of reasons. Many people are put off by the idea of going to a gym by thoughts of huge steroid fueled monsters, but they shouldn't be. Most gyms are frequented by average people, all there for a common purpose. The atmosphere can prove intimidating at first but you must give it time. If you join a gym for cross training, muscle endurance, general weight loss or to use the treadmill you will see huge benefits. Cross training is an essential part of the modern marathon training programme. Often frowned upon by traditional runners cross training is vital for the runner looking for all round strength and fitness. The gym is the ideal environment to achieve this. Cross training works very effectively if you move quickly from one piece of equipment to another, maintaining your heart rate at the correct level. Keeping your heart rate at the optimum level builds endurance and burns fat, but only if it is kept in the right zone for the right amount of time. With equipment in close proximity this can be achieved in the gym. Not only is the gym perfect for the cardio vascular element of your marathon training, it is also the right place for muscular endurance component of it. Muscle endurance, which builds stamina in the muscles, is the type of muscle work that runners need as opposed to adding bulk and size which you don't need. Hamstring curls, leg raises, squats and lunges are examples of the types of exercise you should be doing. Adding this training to your marathon training programme will give your body more tone and less of the "classic runner" physique. Marathon training in cold weather is a challenge no matter how motivated you are. Worse still are icy and snowy conditions when you shouldn't run at all. This is where treadmill training comes in. They allow you to stick to your training plan no matter how hostile the conditions are outside. There is no excuse to miss a marathon training session when you have access to a treadmill. Treadmills can also help in the prevention of injuries. Pounding the pavements relentlessly can cause damage to knees, hips, shins and other body parts. The treadmill unlike the road, has significant shock absorption benefits which can minimize this impact. Another huge benefit of treadmill marathon training is the availability of monitoring information. Running on the road can make monitoring more difficult unless you have a sophisticated GPS monitor, but with a treadmill the information is there at your fingertips. Furthermore, you can increase or decrease your pace immediately and know exactly how far you will run as a result. To sum up, don't be scared or intimidated by the gym. Most people are at the same level and are focused on their own goals. Don't worry about what others are thinking and get on with your own training. Do this and you will take your marathon training to a whole new level! For more Marathon tips and advice Click Here!